Golden Apples: Gusset Done? Check! Is a bit slow going—but it should get faster now—The gussets are done, and the instep 'custard' is following behind—looking all smooth and even. Vanity, vanity, but I am vain about my knitting. No rowing out, no change in gauge as I went from knitting in the round to knitting flat. These socks are going to be slightly longer than average to complete—the sock yarn looks think and plush--(and it is soft in hand!) but it knits up tighter than I realized. 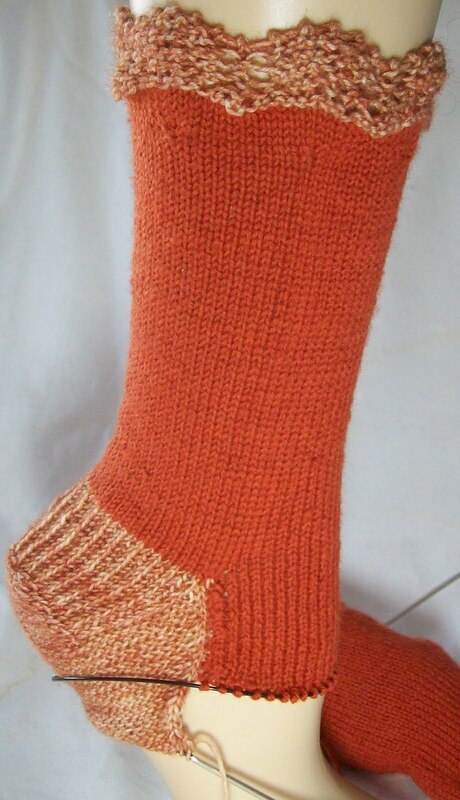 Look how nice the sock looks on LEGS—no bagginess, no excess ease.. Trouble is, they shouldn't! LEGS are way smaller than my real legs—these sock have more negative ease than average—the good thing is, knitting stretches! I can compensate for less width by increasing the length and slightly distorting the gauge when I wear them. I would (coulda, woulda, shoulda) got more knitting done—but instead, I did some mending. And minor sewing –one more canvas shopping tote sewn up—and two torn ones repaired. I have about 8 cloth ones (and 3 plastic ones). They live in my car –that way they are always handy when I want them. Ever week or so, one come 'home' and gets dumped in the wash. And at the same time checked out for wear and tear. I still have a pile more of mending (and ironing) to do-I'll get to it one of these days—and then, do what I've promised myself since the beginning of the year—make some skirts! But when? I don't know. This week will be busy with family and the Maker's Faire-- Tomorrow I have to get out to vote—a special election to replace Mr Weiner (yeah, he was my representative!) I have a bunch of things to print up, too, and the ever present cleaning. Truth be told, I hardly did any this summer, and there is clutter all over! Not helped by having all my terrace chairs and plant racks and planters (the previously hanging planters) stacked up in corners of the living room.